Lock in a great price for Melia Maria Pita – rated 8.9 by recent guests! 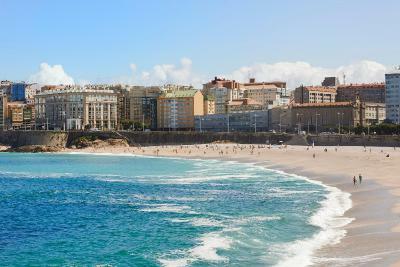 The location, together with the amazing views, made it an outstanding place to stay while visiting A Coruña!! The breakfast buffet is fantastic, as well! The wonderful sea view; the comfy bed; the friendly, helpful staff;the excellent breakfast. . .it was a great two day stay. Even the car was secure with onsite parking. Great location within walking distance of shops and touristy sights. Awesome location on the waterfront, great for sunset. Friendly stuff, nice breakfast, fantastic ocean view. The junior duplex suite is pricy but all the furniture is quite worn out and the wood floor creaked quite badly. We loved the view and overall service. But other types of rooms might stand a better value. Excellent staff. Beautiful property. Great views of water. They ask if they could do anything else too improve. And the answer was no. Karla was amazing. Melia Maria Pita This rating is a reflection of how the property compares to the industry standard when it comes to price, facilities and services available. It's based on a self-evaluation by the property. Use this rating to help choose your stay! One of our top picks in A Coruña.Featuring impressive sea views, the striking Melia Maria Pita is located next to A Coruña's Orzán Beach. This stylish hotel offers private parking, a small gym and elegant rooms with a flat-screen TV. All rooms at the Melia Maria Pita are spacious and bright and they all come with free WiFi. Each has wooden floors, a desk, mini-bar and satellite TV with foreign channels. Free WiFi is available throughout. Galician-style cuisine is on offer in the Trueiro Restaurant, which features an attractive interior patio. A daily buffet breakfast is also available from 7:00 in the dining room. A gluten-free menu is available on request. 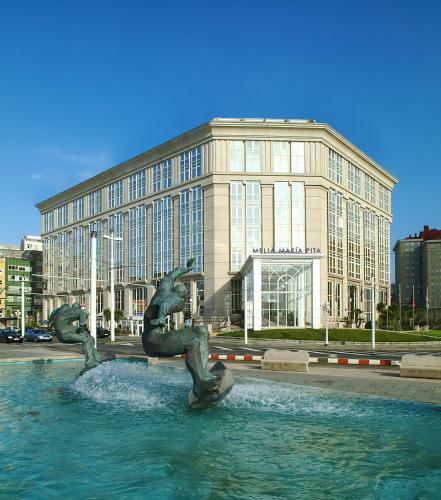 Meliá María Pita is set in the center of A Coruña and within 1,650 feet of attractions such as the Hércules Tower and the Domus Science Museum. The hotel is just 10 minutes’ walk from the port, where you can find the Palexco Congress Center. When would you like to stay at Melia Maria Pita? This elegant, air-conditioned room features flat-screen satellite TV, a mini-bar and a private bathroom with a hairdryer. Free WiFi is available. This quiet room includes 1 double or 2 single beds. Bedding type is allocated on arrival and is subject to availability. 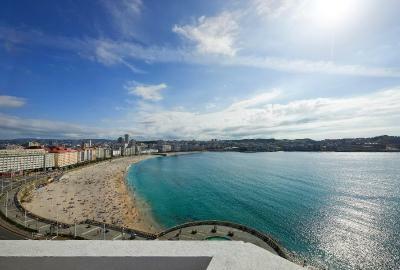 Set over 2 floors, this spacious suite features a sitting area and a balcony with views of La Coruña Bay. Wi-Fi is also included. Spacious room with a small sitting area, work desk and sea views. Wi-Fi is included. This elegant, air-conditioned room features flat-screen satellite TV, a mini-bar and a private bathroom with a hairdryer. Free WiFi is available. 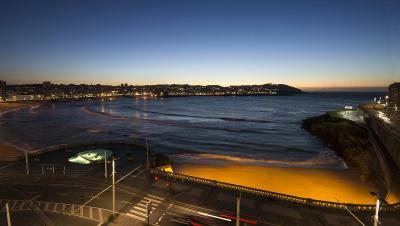 This room offers spectacular views of the sea, and of Orzán and Riazor Beaches. Offering views of the Promenade and partial sea views, these quiet rooms feature are equipped with satellite TV. Free WiFi is available. This quiet room includes 1 double and an extra bed. Bedding type is allocated on arrival and is subject to availability. An extra bed is available on request, subject to availability. This duplex family room has 2 separate bedrooms, one with a double bed and the other with a sofa bed that turns into bunk beds. It features a private terrace, 2 bathrooms, a kettle and mini-bar. Please note, the maximum capacity of this room is 2 adults + 2 children of 10 years old or younger. This family room has a mini-bar, satellite TV and air conditioning. This family room features a satellite TV, view and mini-bar. House Rules Melia Maria Pita takes special requests – add in the next step! All children from 3 to 11 year are charged EUR 20 per person per night when using existing beds. Melia Maria Pita accepts these cards and reserves the right to temporarily hold an amount prior to arrival. No kettle or iron in room. These things are generally standard in a 4 star hotel. Due to it being all marble, it was noisy am, doors banging and staff talking. 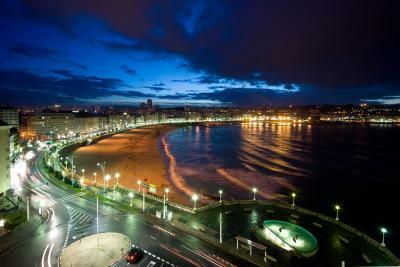 Great location in A Coruna, facilities and staff were excellent. Will come again. Had very noisy upstairs neighbors my last 2 nights, so had a really hard time sleeping! But that happens sometimes! Room was very warm. Had to sleep with the balcone door open. Both my partner and I have stayed at the Melia Maria Pita on several occasions and we came for a long weekend for our anniversary. From the moment we arrived by the lovely Iago, we both said that was the nicest welcome we have recieved and we both felt instantly right at home. Our room which was a Junior Duplex Suite was beautiful, as it was a special occasion I thought of upgrading us to a beautiful room which overlooks A Coruna Bay and the beach front is spectacular ( Sea View is sorely recommended) The facilities were great and the price and location and the staff were excellent throughout and we throughly enjoyed our stay. Breakfast is nice too especially the red velvet cupcakes. So to the Melia thank you and we will be back soon. Very slow reception. Rooms a bit tired for example tiling in the bathroom looked dirty and needed renewing. Large comfortable bed. Excellent breakfast. A nightmare to find the hotel in the local road system. Rooms had a very corporate feel, clean, tidy and functional with all mod cons. We did not pay extra for a room with a view nor did we have breakfast as in spite of being recommended could not face such a banquet for breakfast. Instead we went to the local cafe where we paid 6 euros! Parking quite difficult in the area so we used the hotel car park. An excellent situation for exploring the city. Quiet room with a sea view, clean and relatively modern. Good underground parking. There was a problem with the electricity on the Sunday night and we got stuck in the lift for about 20 minutes Not a pleasant experience!! !